Bio-Antioxidant 2000 capsules provide a combination of nutrients designed specifically to help address the body’s daily requirement for antioxidants. This formulation may be of particular benefit for individuals who may have a high antioxidant requirement due to intensive athletic training or for those who are in the convalescence stage. The immune system is a complex network of tissues, organs, cells, and chemicals that protects the body from infection and illness. 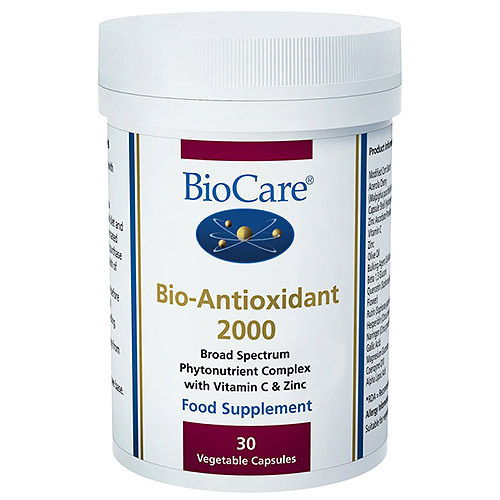 Bio-Antioxidant 2000 is an ideal one a day broad spectrum antioxidant supplement and may be used as a maintenance supplement. Contains standardized, high-potency green tea and ginko extracts. Modified Corn Starch, Capsule Shell (HPMC), Zinc Ascorbate, Olive Oil, Acerola Cherry (Malpighia glabra Berries), Maize Maltodextrin, Bulking Agent (Cellulose),Rutin (Sophorae japonica Flower), Hesperidin (Citrus sinensis Peel), Beta Glucans, Quercetin (Sophorae japonica Flower), Coenzyme Q10, Alpha Lipoic Acid, Magnesium Gluconate, Gallic Acid, Citrus Bioflavonoids (Citrus sinensis Peel),Green Tea Extract (Camellia sinensis Leaf), Grapeseed Extract (Vitus vinifera Seed as Vitaflavan®), Ginkgo Biloba Extract (Ginkgo biloba Leaf), Anti-Caking Agents (Silicon Dioxide & Magnesium Stearate),Lutein, Soya Oil, Modified Tapioca Starch, Bilberry Extract (Vaccinium myrtillus Berry), Limonene Powder (Citrus sinensis Peel), Lycopene Powder (Lycopersicon esculentum Fruit),Antioxidants (Ascorbic Acid, Ascorbyl Palmitate & Natural Mixed Tocopherols), Beta Carotene, Sunflower Oil. Not suitable for use in planned pregnancy, pregnancy or breastfeeding. 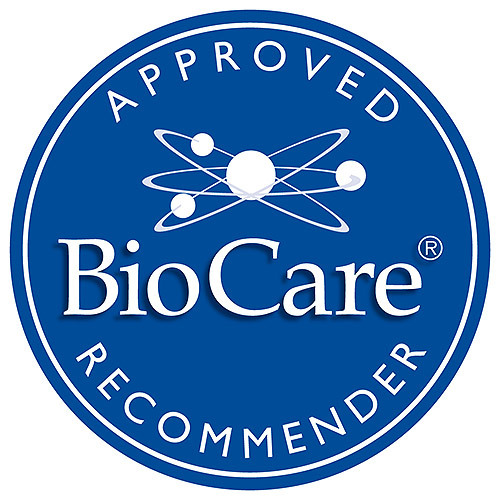 Below are reviews of Bio-Antioxidant 2000 - 30 Capsules by bodykind customers. If you have tried this product we'd love to hear what you think so please leave a review. 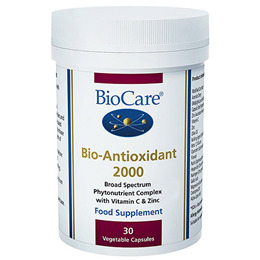 BioCare Bio-Antioxidant 2000 capsules provide a combination of nutrients designed specifically to help address the body`s daily requirement for antioxidants.